Full name is Albertin Aroldis de la Cruz Chapman…has two daughters and one son...Defected from Cuba in July 2009 before the start of the World Port Tournament in Rotterdam, The Netherlands...established residence in the Principality of Andorra, making him a free agent eligible to be signed by any Major League team…at 181 square miles with an estimated population of 77,000, Andorra is the seventh-smallest nation in Europe…it is located in the eastern Pyrenees Mountains, bordered by Spain and France…became a United States citizen in April 2016...4 Along with Andrew Miller and teammate Dellin Betances, was honored with the "Willie, Mickey and the Duke" Award from the New York BBWAA, presented at the annual writers dinner in January 2017. Went 3-0 with 32 saves (in 34 chances) and a 2.45 ERA (51.1IP, 14ER) in 55 relief appearances…opponents batted .136 (24-for-177, 2HR); LH .136 (6-for-44, 0HR), RH .135 (18-for-133, 2HR)…retired 38-of-55 first batters faced (69.1%)…stranded all six inherited runners...Led all Major League relievers with a 16.31 K/9.0IP ratio (51.1IP, 93K)…struck out 43.9% of his batters faced (93K, 212BF)...Collected 26 saves before the All-Star break…only one Yankee since 2005 had more saves in the "first half" (Mariano Rivera, 30 in 2013)...Converted 22 straight save chances from 5/8-7/31…was the third-longest streak of his career (29 straight from 7/4/14-5/30/15; 27 straight from 6/26-9/4/12) and the longest streak by a Yankee since Andrew Miller converted 24 in a row from 4/8-8/6/15...Earned a save in 10 straight appearances from 5/30-6/18, matching the longest streak by a Yankee since 2011 (Mariano Rivera, 11 straight from 8/29-9/21/11 and 10 straight from 4/12-5/1/13)...Allowed 1ER in 11.2IP (4H, 4BB, 19K, 1HP, 1HR) in 12 appearances in June…his 11 saves in June were tied for third-most in a calendar month in Yankees history, trailing only John Wetteland (15 in June 1996) and Sparky Lyle (12 in June 1973)…is just the second Yankee since 2005 to record 11 saves in a month (Rafael Soriano, 11 in June 2012)...Allowed his first HR of the season to Maikel Franco with two outs in the ninth inning on 6/25 at Philadelphia…marked his first regular season HR allowed since 8/25/17 vs. Seattle (Yonder Alonso)…snapped a streak of 176BF without an HR…his 33.2IP had been the most by any pitcher who had not yet allowed an HR in 2018...Threw his fastest pitch of the season at 104.4 mph to Acuña (Statcast) in 7/2 loss vs. Atlanta...Struck out only his batter faced to start the ninth before being removed with discomfort in his left knee in 7/7 win at Toronto...Was named via the Player Ballot to his fifth career All-Star team (also 2012-15) and first as a member of the AL (did not pitch)...Struck out a career-high-tying eight straight batters from his final batter faced on 7/28 (Game 2) vs. Kansas City through his first batter on 8/5 at Boston…prior to the streak, had struck out only two of his previous 15BF…was part of a streak of 10 straight outs recorded via strikeout. 4 Had 25K in 11.1IP over his final 13 relief appearances (beginning in 7/28 Game 2)…collected multiple strikeouts in 10 of those games...Was placed on the 10-day D.L. from 8/22-9/19 with left knee tendinitis…was removed from 8/21 win at Miami after allowing 1BB and throwing one pitch to his second batter faced before being removed with left knee soreness…threw a total of 22 pitches to Kyle Higashioka and Tyler Wade in a simulated game at Yankee Stadium on 9/17...During his D.L. stint (8/22-9/18), four different Yankees recorded saves, each saving at least two games: Dellin Betances (3), Zach Britton (2), Luis Cessa (2), David Robertson (2)…were tied with Tampa Bay for the Majors' third-most saves in that span (Houston-11, Milwaukee-10)...Allowed 1H in 3.0 scoreless innings (1BB, 4K) over three postseason relief appearances. Went 4-3 with 22 saves (in 26 chances) and a 3.22 ERA (50.1IP, 18ER) in 52 relief appearances…opponents batted .200 (37-for-185, 3HR); LH .175 (10-for-57, 2HR), RH .211 (27-for-128, 1HR)…retired 33-of-52 ﬁrst batters faced (63.5%)…allowed 4-of-15 inherited runners to score (26.7%)... According to MLB's Statcast, 345 of his 879 pitches were thrown at 100 mph or faster (39.2%)…also posted the highest average fastball velocity in the Majors (100.0 mph)... Allowed homers by two left-handed batters (Rafael Devers on 8/13 vs. Boston and Yonder Alonso on 8/25 vs. Seattle)…allowed just 1HR to a left-handed hitter in his ﬁrst 418 career appearances... Was placed on the 10-day disabled list on 5/14 (retroactive to 5/13) - 6/18 with left shoulder rotator cuﬀ inﬂammation (missed 33 team games)…made one rehab appearance with Double-A Trenton... On 8/13 vs. Boston, allowed a game-tying solo HR to Rafael Devers in the ninth and the winning run in the 10th (1.1IP, 1H, 2ER, 1BB, 3K, 1HR, 1HP)…the homer to Devers was just the second HR allowed to a left-handed hitter in either a regular season or postseason game in his career (also Luke Scott on 6/26/11 at Baltimore w/ Cincinnati)…faced 405 left-handed batters between homers (regular and postseason)…also snapped a career-long 76-appearance streak without a HR overall…had not allowed a regular season HR since giving up back-to-back HRs to Eduardo Escobar and Kurt Suzuki on 6/18/16 at Minnesota…48 of the 76G during the streak came as a Yankee, tying him for the eighth-longest streak of relief appearances without a HR in club history... Entered 8/20 loss at Boston in the sixth inning and retired 4-of-5 batters faced (1.1IP, 1BB, 2K, 1WP)…had not entered a game before the eighth inning since 5/17/12 at the Mets w/ Cincinnati…had not entered a game before the seventh inning since 9/23/11 at Pittsburgh w/ Cincinnati... Over his ﬁnal 14 appearances (8/20-9/30), posted a 0.61 ERA (14.2IP, 1ER) with 19K... Was named AL "Reliever of the Month" for the ﬁrst time in his career in September…retired 36-of-41 batters faced, tossing 12.0 scoreless innings with six saves in 11G in September (3H, 2BB, 17K)... Earned his 200th career save in 9/13 win against Tampa Bay at Citi Field (1.1IP, 1H, 2BB, 4K), the 49th pitcher to reach the milestone... In six postseason relief appearances, went 0-1 with three saves, a 1.13 ERA (8.0IP, 1ER) and 16K... Closed out ALDS Game 5 at Cleveland with 2.0 scoreless innings (1BB, 4K) to earn his longest save of 2017…was the second-longest of his seven career postseason saves (2.2IP in 2016 World Series Game 5 vs. Cleveland w/ Chicago-NL). Combined with the Yankees and Cubs to go 4-1 with 36 saves (in 39 chances) and a 1.55 ERA (58.0IP, 32H, 12R/10ER, 18BB, 90K) in 59 relief appearances…opponents batted .158 (32-for-203, 2HR); LH .135 (5-for-37, 0HR), RH .163 (27-for-166, 2HR)…retired 49-of-59 first batters faced (83.1%)…allowed 6-of-12 inherited runners to score (50.0%)…among relievers, ranked third in opponents' batting average, fourth in ERA, sixth in save percentage (92.3%), seventh in K/9.0IP (13.97) and tied for 11th in saves. According to MLB's Statcast, threw the 30 fastest pitches in the Majors in 2016, with the fastest coming on a 105.1 mph fastball on 7/18 vs. Baltimore…also posted the highest average fastball velocity in the Majors (100.9 mph), ahead of Atlanta's Mauricio Cabrera (100.6). Began the season with the Yankees, going 3-0 with 20 saves (in 21 chances), a 2.01 ERA (31.1IP, 7ER) and 44K in 31 relief appearances…posted a 12.64 K/9.0IP ratio and a 36.7% strikeout rate (44K, 120BF). Became the 11th pitcher in Yankees history with at least 20 saves in a season and fifth different such pitcher in as many seasons (also Andrew Miller-36 in 2015, David Robertson-39 in 2014, Mariano Rivera-44 in 2013 and Rafael Soriano-42 in 2012). The Yankees went 19-2 when each member of the trio of RHP Dellin Betances, LHP Andrew Miller and LHP Aroldis Chapman pitched in the same game…in those 21 games, the trio combined to post a 1.36 ERA (66.1IP, 34H, 11R/10ER, 18BB, 101K, 2HR). Began the season on the restricted list after accepting a 30-game suspension for violating Major League Baseball's Joint Domestic Violence, Sexual Assault and Child Abuse Policy…was suspended by Commissioner Rob Manfred on 3/1 and reinstated on 5/9. Made his Yankees debut in 5/9 win vs. Kansas City, allowing 1ER in 1.0IP (2H, 2K)…struck out his first two batters faced (Infante and Cuthbert). Earned his first save as a Yankee in 5/10 win vs. Kansas City, tossing a scoreless ninth (1.0IP, 1BB, 1K, 1WP. In 5/27 win at Tampa Bay, closed out the game with 2K in 0.1IP…became first Yankees pitcher since at least 1913 to finish an appearance with 2K in 0.1IP…struck out Logan Morrison with two outs in the ninth inning, but he advanced to first on a passed ball by McCann…struck out Desmond Jennings to end the game…became the fourth Yankees pitcher since 1913 to record more strikeouts than outs, joining David Robertson on 8/6/09 vs. Boston (0.2IP, 3K), Sterling Hitchcock on 6/30/94 at Boston (0.0IP, 1K) and Ron Davis on 9/17/80 vs. Toronto (0.2IP, 3K). Blew his only save as a Yankee on 6/5 at Baltimore after converting his first nine save opportunities (0.2IP, 2H, 1R/0ER, 2K)…for the fifth consecutive season, a different Yankees reliever converted at least nine save chances before recording a blown save: Chapman (first nine in 2016), Andrew Miller (first 24 in 2015), David Robertson (first nine in 2014), Mariano Rivera (first 18 in 2013) and Rafael Soriano (first nine in 2012). Earned his first win as a Yankee on 6/22 vs. Colorado, tossing a perfect ninth (1.0IP, 2K). Tossed a regular season career-high 2.1 hitless innings (1BB) with season-high-tying 4K to record his third win on 7/9 at Cleveland (also had 4K in 2.0IP on 9/4 vs. San Francisco w/ Chicago-NL). Tossed a scoreless ninth in 7/18 win vs. Baltimore for his 19th save (1.0IP, 1BB)…threw the five fastest pitches ever tracked by MLB Statcast (at the time), ranging from 104.0 to 105.1 mph…his 105.1 mph fastball (on the sixth pitch to J.J. Hardy) matched his Major League-record 105.1 mph fastball that was clocked by Pitch f/x on 9/24/10 w/ Cincinnati at San Diego. Tossed 2.0 scoreless innings (1H, 3K) in 7/23 loss vs. San Francisco…threw 36 pitches, tied for the third-highest single-game total of his career (most since 9/15/15 at San Francisco-42 w/ Cincinnati). Finished his time with the Yankees on an 11.1-inning scoreless streak over nine appearances from 6/30-7/23. Following the All-Star break, recorded a 0.83 ERA (32.2IP, 3ER) in 33 appearances…held opponents to a .127 (14-for-110) batting average and did not allow a home run. Was traded by the Yankees to the Cubs on 7/25 in exchange for RHP Adam Warren, 2016 Arizona Fall League MVP INF Gleyber Torres, OF Billy McKinney and OF Rashad Crawford. In 28 games for the Cubs, went 1-1 with 16 saves (in 18 chances), a 1.01 ERA (26.2IP, 3ER) and 46K…his ERA ranked as the fourth-lowest mark by a Cubs reliever all-time in the season's second half (min. 20G)…from the time of his Cubs debut on 7/27 through the end of the season, ranked fourth in the NL in saves…posted a 15.53 K/9.0IP ratio with Chicago-NL. Surrendered just 1H over 9.0 scoreless innings in September, holding batters to a .036 (1-for-28) batting average with 16K in eight games. During the postseason, went 2-0 with four saves, a 3.45 ERA (15.2IP, 6ER) and 21K in 13 relief appearances…no other pitcher appeared in more than 11 postseason contests…his 15.2IP were the second-most among relievers in the playoffs, trailing only Cleveland's Andrew Miller (19.1IP). Finished Game 6 of the NLCS against the Dodgers, tossing 1.2 hitless innings (1BB, 1K) to send the Cubs to their first World Series since 1945. With the Cubs facing elimination in World Series Game 5 against Cleveland, tossed a career-high 2.2 innings to earn the save (1H, 1HP, 4K)…recorded the win in the Cubs' 10-inning World Series Game 7 victory to secure the club's first championship since 1908. Among all National League rookies ranked T7th in apps, all in relief, in his first full season inthe Major Leagues...from 5/16-6/23 was on the disabled list with left shoulder inflammation...from 5/23-6/21made 9 rehab apps for Carolina and Louisville...in 38 apps after he came off the DL on 6/24 posted a 2.43era(37ip, 18h, 10er, 21bb, 56k)...began the season with 12 scoreless apps for the Reds (11.2ip) but allowedruns in each of 4 apps prior to his disabling (1.1ip, 2h, 10er, 12bb, 3k)...his season ERA excluding those 4apps drops from 3.60 to 1.85 (48.2ip, 10er)...over 9 apps from 7/18-8/5 didn't allow a hit in 10.1 innings, thelongest single-season hitless streak by a Reds reliever since Chuck McElroy's 11.1-inning hitless stretchfrom 4/25-5/17, 1994...during that stretch retired 30-31 batters (1bb, 17k), including a season-high streak of17 straight snapped on 7/28 vs NYM when he walked Jose Reyes...earned his only Major League save inthe 13-inning, 9-8 win on 7/6 at StL...had a team-best 4 pickoffs (Ari's Stephen Drew, Mil's Corey Hart twice,Bal's Mark Reynolds)...on 4/18 vs Pit hit 106mph on the GABP scoreboard gun...following the season made2 relief apps in the Arizona Fall League (2.2ip, 1h, 1er, 2bb, 2k), then didn't pitch again the rest of the winterwhile recovering from general shoulder stiffness. Was 1 of 10 Reds players to make his Major League debut...began the season with Louisville, where he ranked fifth in the International Leaguein strikeouts (125) and led the league in wild pitches (14)...in Baseball America'sBest Tools issue, his fastball and breaking pitch were voted the best in the IL...madehis first 13 apps for the Bats as a starter (5-5, 4.11) and his last 26 apps in relief(4-1, 2.40, 30ip, 17h, 12bb, 49k, converted 8-9 save ops, .156oba)...for Louisville,didn't allow a hit in his last 8 apps (8ip), in his last 20 apps posted a 0.83era (21.2ip,2er) and in his last 13 apps opposing batters went 4-for-48 (.083, 13.1ip, 4bb, 25k)...in his final minor leagueappearance, on 8/27 vs Columbus, hit 105mph on the radar gun...on 8/31 was promoted and that night vsthe Brewers made his Major League debut by throwing a perfect eighth inning with scoreboard pitch speedsof 98, 86, 102, 86, 100, 103, 101 and 98mph...struck out his first batter, Jonathan Lucroy, including one pitchclocked at 103.9mph...on 9/24 at SD threw all 25 pitches at least 100 miles per hour, with a high of 105 againstTony Gwynn and 3 others at 104...his pitch against Gwynn is the fastest ever recorded using the Pitch/FXsystem...for the season, 75 times reached at least 100mph on Pitch/FX...earned his first career victory in the6-1 win on 9/1 vs Mil in just his second big league appearance...on 9/28 vs Hou threw a perfect ninth inning toearn the 3-2 win that clinched the NL Central Division title...in Game 2 of the National League Division Seriesat Phi suffered a blown save and the 7-4 loss after the Phillies scored 3 unearned runs in the seventh inningfollowing 2 Reds errors...pitched a scoreless ninth inning in the 2-0 loss in Game 3. September 19, 2018 New York Yankees activated LHP Aroldis Chapman from the 10-day injured list. August 22, 2018 New York Yankees placed LHP Aroldis Chapman on the 10-day disabled list. Left knee tendinitis. June 18, 2017 New York Yankees activated LHP Aroldis Chapman from the 10-day disabled list. June 16, 2017 New York Yankees sent LHP Aroldis Chapman on a rehab assignment to Trenton Thunder. June 13, 2017 New York Yankees sent LHP Aroldis Chapman on a rehab assignment to Tampa Yankees. May 14, 2017 New York Yankees placed LHP Aroldis Chapman on the 10-day disabled list retroactive to May 13, 2017. Left shoulder rotator cuff inflammation. December 15, 2016 New York Yankees signed free agent LHP Aroldis Chapman. November 3, 2016 LHP Aroldis Chapman elected free agency. July 26, 2016 Chicago Cubs activated LHP Aroldis Chapman. July 25, 2016 New York Yankees traded LHP Aroldis Chapman to Chicago Cubs for RHP Adam Warren, SS Gleyber Torres, RF Billy McKinney and OF Rashad Crawford. May 9, 2016 New York Yankees activated LHP Aroldis Chapman from the restricted list. 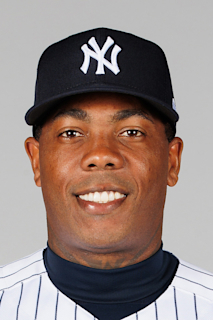 April 3, 2016 New York Yankees placed LHP Aroldis Chapman on the restricted list. December 28, 2015 New York Yankees Traded RHP Caleb Cotham and RHP Rookie Davis to Cincinnati Reds; Trenton Thunder Traded 3B Eric Jagielo and 2B Tony Renda to Pensacola Blue Wahoos and Cincinnati Reds Traded LHP Aroldis Chapman to New York Yankees. June 25, 2015 Cincinnati Reds activated LHP Aroldis Chapman from the paternity list. June 23, 2015 Cincinnati Reds placed LHP Aroldis Chapman on the paternity list. May 10, 2014 Cincinnati Reds activated LHP Aroldis Chapman from the 15-day disabled list. May 6, 2014 Cincinnati Reds sent LHP Aroldis Chapman on a rehab assignment to Louisville Bats. May 1, 2014 Cincinnati Reds sent LHP Aroldis Chapman on a rehab assignment to Dayton Dragons. October 22, 2011 LHP Aroldis Chapman assigned to Phoenix Desert Dogs. June 24, 2011 Cincinnati Reds activated LHP Aroldis Chapman from the 15-day disabled list. June 21, 2011 sent LHP Aroldis Chapman on a rehab assignment to Louisville Bats. June 7, 2011 Louisville Bats sent LHP Aroldis Chapman on a rehab assignment to Carolina Mudcats. May 23, 2011 Aroldis Chapman assigned to Louisville Bats. May 16, 2011 Cincinnati Reds placed LHP Aroldis Chapman on the 15-day disabled list. Left shoulder inflammation. August 31, 2010 Cincinnati Reds recalled Aroldis Chapman from Louisville Bats. April 2, 2010 Cincinnati Reds optioned Aroldis Chapman to Louisville Bats. January 11, 2010 Cincinnati Reds signed Aroldis Chapman.